Peepholes are great for sizing up those who knock on your home or apartment door, but not so great when it comes to driving. Yet we've all seen these knuckleheads who don't scrape off their windows or clear their car of snow before cruising down the highway at warp speed putting themselves and fellow motorists in danger. It seems this would be common sense, but apparently not. It happens so often that the State Patrol on Monday had to put out a stern reminder clear their windshields, and rear and side windows before hitting the roads. "Don’t be this guy! You know snow is coming. Be ready. Law requires your vision to be unobstructed. And lights on!" the State Patrol said. Not only is the law watching for you, those who flaunt the law are drawing the ire from other drivers. "I cannot stress enough how important it is to wipe ALL of the snow off your vehicle. It is really bad when you are behind someone who has not even wiped off the roof and they are blinding you,"wrote Lisa Austin on the patrol's Facebook page. 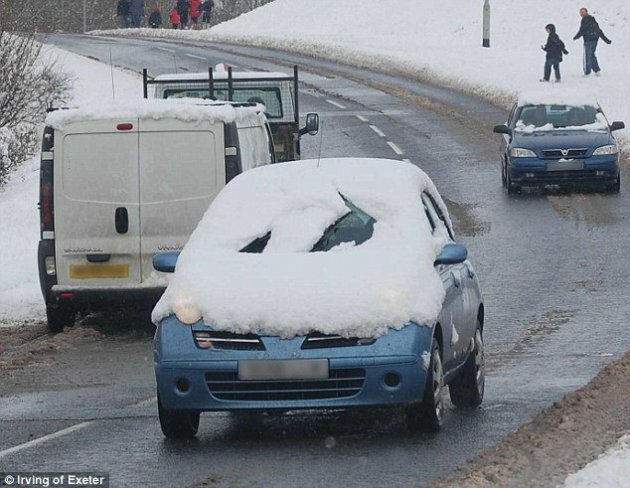 "Or when someone only has a small portion of their window wiped off in the front or back people don't understand how dangerous this really is not only for them but for other people because they can't be seen." Should you see this guy, feel free to call 911. And then snapa a photo, if you can do so safely, and send them to drive@startribune.com.